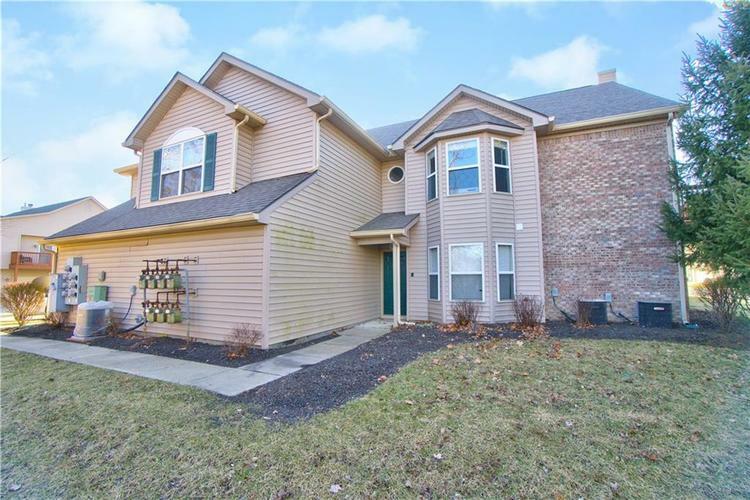 COME SEE THIS MOVE IN READY CONDO IN VILLA WOODS! 3 BDRM, 2 FULL BATH, UPSTAIRS UNIT. OPEN FLOOR PLAN WITH VAULTED CEILINGS. KITCHEN HAS BREAKFAST BAR, TILED BACKSPLASH, SOLID SURFACE COUNTERTOPS, PANTRY AND ALL APPLIANCES STAY. SPLIT BEDROOM FLOOR PLAN. MASTER HAS WIC AND BALCONY OFF BDRM. 2 CAR ATTACHED GARAGE W/EXTRA STORAGE. THIS CONDO IS AN END UNIT WITH A TREE LINE VIEW AND CUL-DE-SAC. CLOSE TO SHOPPING TO RESTAURANTS. A MUST SEE! Directions:From I-465 - US 36 West to Avon Village Parkway (Located on the westside of walmart in Avon). North All the way to the last street. Turn Right and follow to the end of Meadow Woods.